The developing world also lacks America’s thriving NIMBY industry—the preservationists, public intellectuals, and grassroots local groups that rally to the call of “not in my backyard.” Westway, an ambitious park and highway plan for Manhattan proposed in the 1970s, still stands as the most significant grand urban project to fall to protest, but the power accumulated by downtown residents in the debate over the future of Ground Zero (and the results they achieved in shap­ing the project to their needs) attests to the role that public resistance can play in tempering even the most exceptional civic vision. Even if the will were present and the money lined up, a normal American sky­scraper, free of symbolic freight, doesn’t stand a chance now to reach an interna­tionally competitive height. Cost and resistance are part of the story, but the most pressing reason that we won’t soon see a Burj Chicago is more subtle, more emotional: the lack in America’s traditional urban centers of that upstart spirit, a kind of invin­cible optimism, possibly shading into hubris, that is the birthright of the achieving underdog, and that will move people to pursue what may be an econom­ically irrational goal in order to make their potential known to the wider world. In other words, chutzpah. That spirit was abundant in the past—the Empire State Building so outstripped economic necessity that for years it was referred to as the Empty State Building—but now that typically American quality is flourishing in points East. 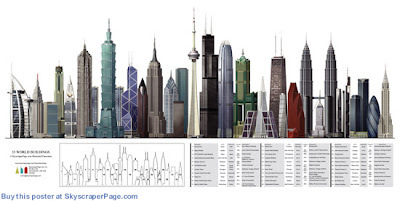 Here's a cool poster for sale from SkyscraperPage showing the worlds tallest buildings side by side.